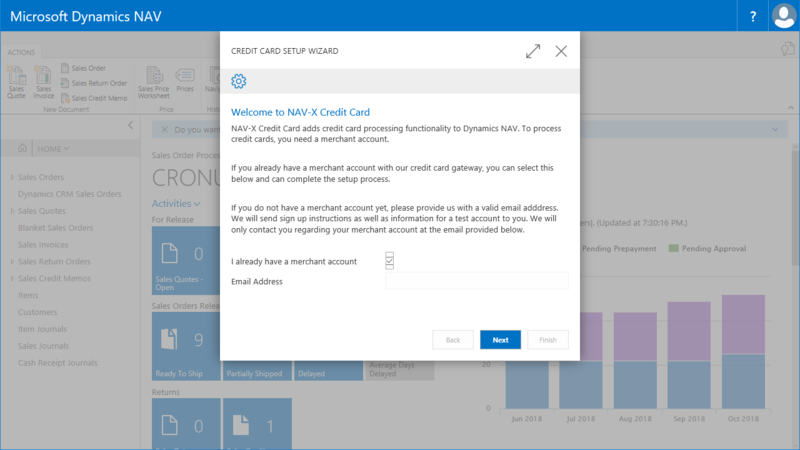 Before you can use NAV-X Credit Card, you need the functionality implemented in your Microsoft Dynamics NAV implementation. You can work with your partner to either implement and merge the credit card objects or, if you are on Microsoft Dynamics NAV 2017 or higher, you can also install the NAV-X Credit Card extension. Please contact your partner for assistance with this. 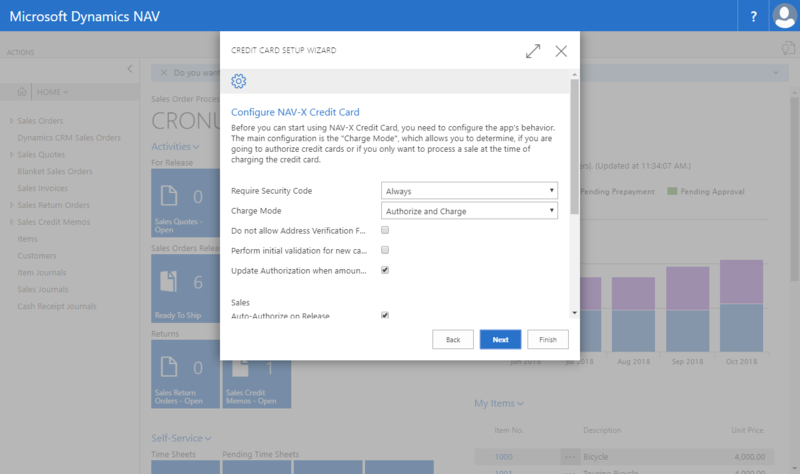 You can start the Assisted Setup for NAV-X Credit Card from the displayed notification on the role center or by searching for “Assisted Setup” and then selecting “Setup Credit Card” from the displayed list. 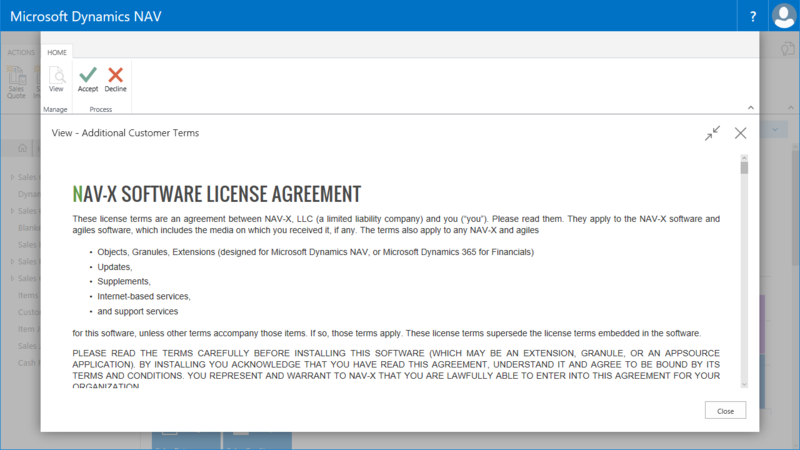 If you start the Assisted Setup for the first time, the NAV-X End User License Agreement is displayed. Please read the license terms carefully and, if you agree to the terms, please accept them with the “Accept” action on the top ribbon. If you do not agree to the license terms, please select “Decline” and then uninstall the app from your tenant. NAV-X Credit Card supports two different ways of charging credit cards. Usually, the first option is recommended, but based on your processes, you can change the way you are processing credit cards. Authorize and Charge. With this setup, credit card transactions are authorized at the time of releasing an order or when you manually authorize a card. The authorization guarantees that money is available on the credit card to charge the card later, when the invoice is posted. Sale. With this setting, credit cards will not be authorized. You will process a charge against the credit card at the time of posting an invoice or when you manually select to charge the credit card. The downside with this setup is that the credit card might not have sufficient funds at the time of invoicing and the order might have been shipped already. At the time of entering a new credit card, authorizing a credit card, or processing a sale against a credit card, the credit card processor performs an address verification to determine, if the credit card billing address is correct. If you activate this setting, the credit card transaction cannot be processed, if the address verification fails. 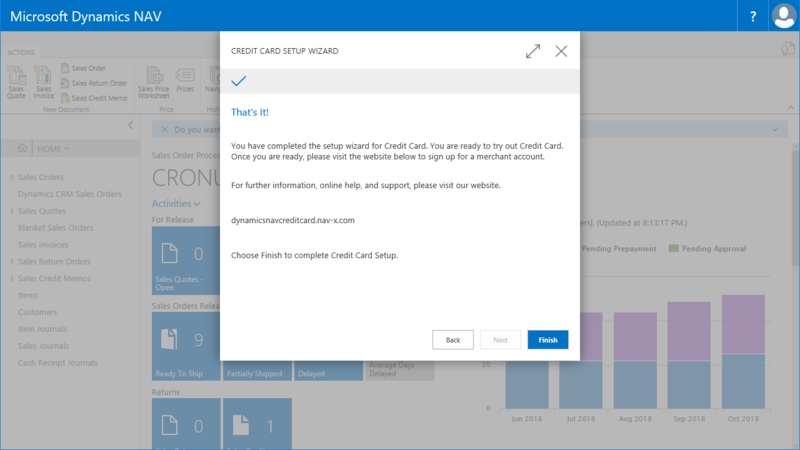 If you do not activate this setup, a confirmation message is shown when an address verification fails and you can still choose to process the credit card. If you place a check mark in this field, an authorization is only automatically processed at the time of releasing an order, when there is no authorization existing yet. You will then have to process subsequent authorizations manually. The next step of the Assisted Setup allows you to define either a percentage of the order amount or a fixed amount, which will be added to each authorization of a credit card to account for fees or charges that are not known at the time of order entry. When defining a “Type” other than “None”, you have to define, if you want to use a Resource or a G/L Account in the field “Line Type” and then the resource or G/L account number in the field “Line No.”, which then will be used to create an additional line on the document in the amount defined. If you have chosen not to enter additional merchant accounts at this time, the following step will not be visible and you will see the next step. 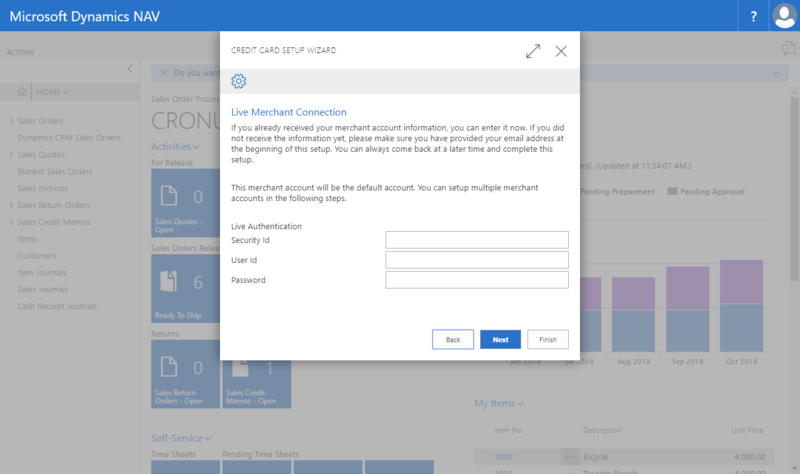 To enter multiple merchant accounts, please create a new line in the list of merchant accounts. You can define a description and the same credentials as described above for each of those merchant accounts. In addition, you can also specify a specific Dimension Value or Currency Code to define when a specific merchant should be used. This can be used to have different merchants for different currencies or for different divisions. You can define workflows that allow the notification of different users when a credit card transaction fails. For instance, you can define a workflow for someone to take action, when an authorization fails for a sales order. The workflows currently only exist for sales orders and sales invoices, not for service orders due to limitations in the Dynamics NAV functionality. 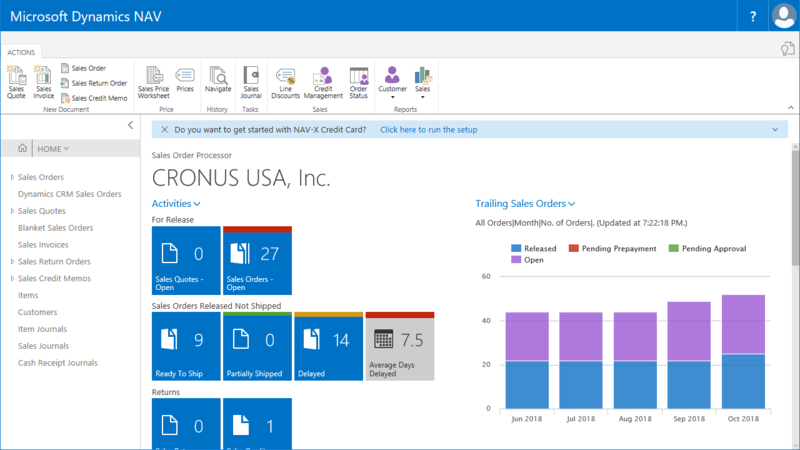 Sales orders cannot be released until the workflow is completed. If you want to configure the users that should be alerted now, please place a check mark in the field “I want to configure my workflows”. 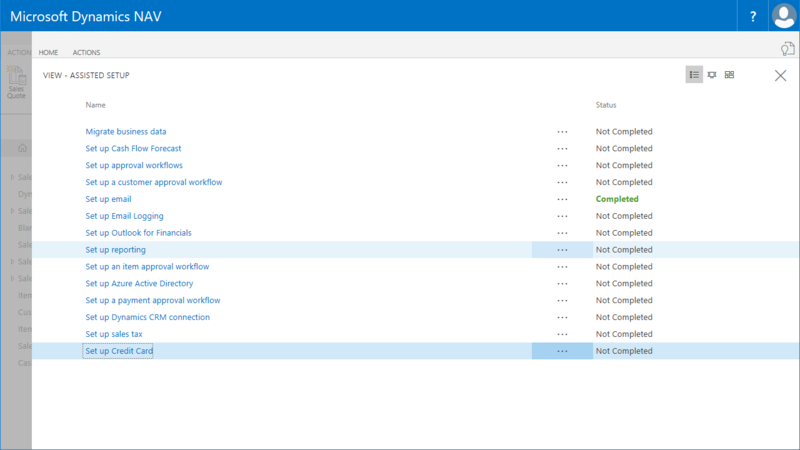 If you have chosen not to configure workflows now, the next step will not be visible. If you want to configure your workflows now, please select the users that should be alerted of a failed credit card transaction. Any one of the users selected can approve a transaction. The next step is the final step of this setup wizard. Once you select “Finish”, the setups are saved and you can start using NAV-X Credit Card or complete additional setups.